A rag-taggle band of Irishmen who followed Gen. John O'Neil into Canada in June of 1866 hardly looked as elegant as the artist conceived them in this sketch of the Fenians' first and last victory in the Battle of Ridgeway. CANADA MIGHT be known as "New Ireland" today had an Irish invasion of that country succeeded in 1866. Discontent was rife in Ireland as indeed it had been for centuries. An unsuccessful attempt to throw off the English yoke had been made in 1865. The same year the Fenians, a group of Irish revolutionaries, during a New York City convention, laid plans for invading Canada. It was proposed to hold that country as a hostage until freedom was gained in the Emerald Isle. Plans envisioned the Irish Navy sweeping Lake Huron, Lake Erie and Lake Ontario. Irish privateers were to prey upon British shipping, close the St. Lawrence and reduce Quebec. The Irish Navy, it should be added, at the time consisted of five sailing vessels, a tug and two steamer transports, docked at Chicago. ... the Fenians, a group of Irish revolutionaries, during a New York City convention, laid plans for invading Canada. It was proposed to hold that country as a hostage until freedom was gained in the Emerald Isle. But, if the Fenians lacked a formidable¢ navy, they did not lack for optimism. A manifesto announced that the whole of the British provinces would fail in a single campaign, adding: "By the tempting offer of a surrender of Canada to the United States, Mr. Seward (U.S. Sec. of State Willam Seward), it is hoped, will wink at connivance between American citizens and the Fenian conquerors. . . (and) by another summer it was thought that the Brotherhood north of the St. Lawrence would be formally recognized. With the reduction of Canada a demand would be made upon the United States for a formal recognition of Canada, whose name is to be changed to New Ireland." DURING THE SPRING of 1866, members of the Fenian Army began to gather along the U.S.-Canadian border, and Buffalo was one of the gathering points. It was natural that the sudden arrival of so many strangers should cause concern among Buffalo officials. Mayor Wells telegraphed the mayors of Toronto and Hamilton, and Buffalo police were ordered to remain on duty all night. The U.S. marshal was notified. The United States warship "Michigan" was alerted for immediate service. Major Durr, at Ft. Porter, near the present site of the Peace Bridge, after being informed of the Fenians' presence, disclosed he had only 50 regulars and "little war material on hand." Indeed, at this juncture, the Fenians (many of them Civil War veterans) seemed to be more amply supplied than the U.S. Army, for, as the local press reported, "five wagon loads of ammunition for their use had rolled into town, while Paddy O'Day's at 2~23 Pearl St. was packed to the rafters with boxes of muskets, pistols and other war equipment." Meanwhile the Fenians kept pouring into Buffalo -- from Nashville, Louisville, Cincinnati, Indianapolis, Columbus and other western areas, and were, the press reported, drilling in O'Day's cellar, "where, darkened windows kept it a secrets from prying eyes." THE BUFFALO press, ever on the alert, reported the Fenians were young men, most of them 20 to 27. Many wore black felt hats. Others favored the stovepipe hat, then so popular among well dressed gentlemen. Their discipline was considered, for the most part, good; though several brawlers fell into the hands of police. On the night of May 31, Brig. Gen. John O'Neil was designated to command the invasion. An idea of the lack of plans is drawn from O'Neil's later official report, in which he concedes that he had no written instructions nor even a map of the Canadian countryside. Despite these manifest shortcomings, O'Neil assembled his force, estimated at about 800. At midnight his little army, ready to face the might of the British empire, marched to Lower Black Rock on the Niagara River, about three miles from Buffalo. Somewhere along the line of march, some 200 Fenians either drifted away in the shadows or were swallowed up by the night. For Gen. O'Neil later admitted that only 600 men were at his side at 3:30 a.m. when the army boarded four canal boats to be ferried across the Niagara. At 4 a.m., Col. Starr planted the Irish flag on British soil, thus giving the Irish at least a moral victory. GEN. O'NEIL at once issued orders to cut all telegraph wires from Ft. Erie. Five minutes later, with admirable efficiency, he sent a party of men to destroy the railroad bridge leading to Port Colborne. Considering his rank, Gen. O'Neil was poorly mounted. He moved about Ft. Erie on an anemic nag. The reins were made of clothesline; the saddle was of an "antique pattern." A reporter sized up O'Neil as about 35, of medium build and of "sturdy physique." A Buffalo newspaperman, visiting the Fenian camp, found two green flags flying and rumors flying as well. The invaders presented a motley appearance; some wore artillery jackets and others wore sober black broadcloth dress coats. There was, an observer noted "a decided preference for green." A report on Saturday, June 2, disclosed that the Fenians had burned two bridges at French Creek and Miller's Point. At 2 a.m. on June 2, a report from Ft. Erie noted "all quiet -- a little cheering at Ft. Erie -- probably bad whiskey, possibly the arrival of reinforcements. " Gen. O'Neil later report showed that he had broken camp and headed for Chippewa at 10 p.m. June 1. At midnight, the Fenians changed direction however, marching toward Ridgeway along the Limestone Ridge Road. O'Neil explained that the abrupt change in direction was prompted by a report received at 8 p.m., that a British force estimated a 5,000, with artillery, was advancing toward the Fenian camp. BY DAYLIGHT on June 2, the Irish army had advanced to within three miles of Ridgeway, or about six miles west of the Niagara River. Here, Col. Starr in command of advance skirmishers, encountered a mounted patrol, which Starr forced back. Gen. O'Neil ordered his skirmishers forward to form a battalion parallel to the enemy behind hastily improvised breastworks. 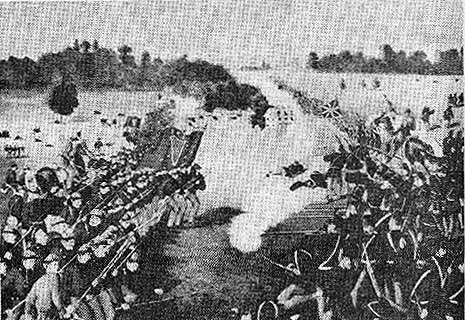 The rival forces now began to exchange fire, which continued for about a half hour. Perceiving the enemy was trying to turn his flanks, Gen. O'Neil ordered his men to fall back about 100 yards. The U.S. Steamer "Michigan" fired a shot from its 12-pound pivot gun across the prow of the scow, warning the Fenian vessel would be sunk unless it hauled to and surrendered. The British, according to O'Neil, believing the Fenians were in headlong flight, began a rapid pursuit. The Irish waited until the British had reached a point close to their line, poured a volley into their ranks and then charged. The Irishmen must have been in excellent condition, for their leader claims they chased the British three miles, adding that the enemy in their flight, threw away their knapsacks and guns and "everything that was likely to retard their speed." Twelve of the British were claimed as prisoner; about 30 were wounded and a dozen lay dead, according to Fenian claim. Gen. O'Neil reported his men did not abandon the pursuit until a mile beyond Ridgeway. Even though the Fenians had achieved a momentary victory, their position was precarious. O'Neil's forces had dwindled away and now numbered 400, against the enemy's strength of 1,400 comprised of the "Queen's Own" and the 13th Hamilton Battalion. Also, reinforcements were reported advancing from Port Colborne. Despite his victory, O'Neil decided to move back to Ft. Erie and seek reinforcements from the United States. Wounded Irishmen were placed aboard wagons and several were left with Canadian citizens who promised to care for them. The dead were buried and a retreat was begun. When he reached the Niagara, Gen. O'Neil sent a message to Buffalo, stating that the enemy could surround his forces before morning with as many as 5,000 troops. INSTEAD OF SENDING help, Capt. Hamilton crossed the Niagara and informed O'Neil that arrangements had been made for him and his men to recross the river to the United States. About midnight, boats from Buffalo arrived and all, save a few of the wounded, were evacuated aboard a scow, which, as it neared the American side, was hailed by the tug "Harrison." The U.S. Steamer "Michigan" fired a shot from its 12-pound pivot gun across the prow of the scow, warning the Fenian vessel would be sunk unless it hauled to and surrendered. Gen. O'Neil had no choice but to surrender, "because we respected the authority of the United States in defense of which many of us had fought and bled during the late war." The Fenian officers were removed from the "Michigan" and treated well. Unfortunately, the depleted Fenian troops were kept aboard the scow, unprotected during a torrential downpour. There, they remained for four days, after which they were discharged on their own recognizance for a later appearance to face charges of violating the neutrality laws. Despite the failure of the campaign. not surprising in view of the lack of even elementary equipment, the Fenians, like true Hibernians, "fought magnificently", as a battle front correspondent for the Buffalo Morning Express attested. In fact, reported the same correspondent, "The forces on both sides fought with great bravery and showed admirable stuff." Illustration reprinted from "Niagara Land: the First 200 Years"